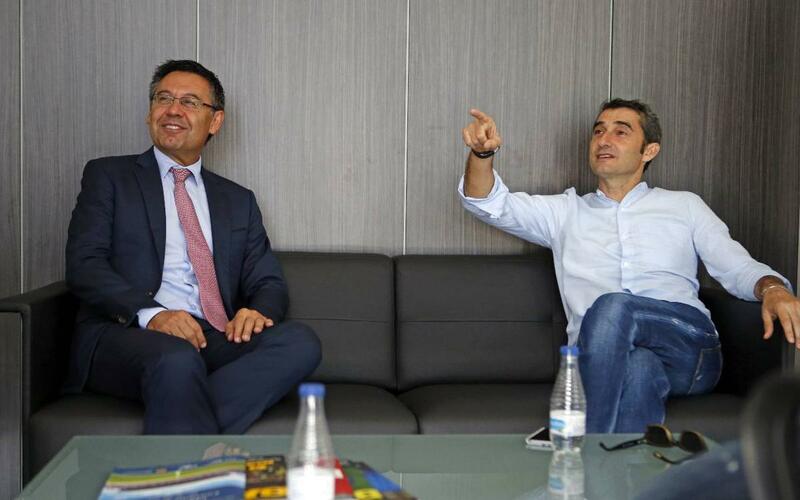 On Monday, alongside president Bartomeu, Ernesto Valverde visited the Club’s training ground the Ciutat Esportiva. The director of professional sport, Albert Soler and the technical secretary Robert Fernández, were also present along with Fernández’s assistant, Urbano Ortega, and the first team delegate, Carles Naval. The party took a tour of the facilities with the new Barça coach getting his first look at what will be his main place of work as of next season. Valverde saw the dressing rooms, his office, the Tito Vilanova training field and the rest of the training pitches at the Ciutat Esportiva as well as the press room and the coaching staff’s offices. The Barça coach bumped into first team player Aleix Vidal, the latter training at the facilities, during his visit. Ernesto Valverde was presented as the new Barça coach on 1 June, signing a contract for two seasons with an option for a third.